Dia-Stron colleagues Dr Rebecca Lunn, Daniel Stringer, Yann Leray and Dr Steve Bucknell have recently had their first collaborative paper published in the Journal of Cosmetic Science on the subject of Quasi-Static Torsional Deformation of Single Hair Fibres. 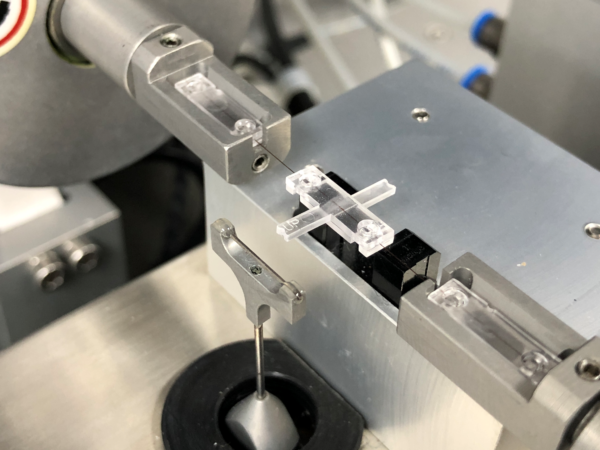 The paper provides further understanding of a relatively unexplored area of single hair fibre mechanical testing – torsional measurements. Because of the structural properties of human hair, these measurements can provide alternative insights into the structural components of the hair nearer to the hair’s surface (e.g. the cuticle) that the more frequently used tensile measurements cannot. A core/shell modelling approach was applied to separate out the potential contributions of the cuticles and the cortex on the fibre torsional modulus and the effect of relative humidity on hair fibre structural components. There are various methods and instruments capable of performing torsional measurements on single hair fibres, and the first part of the paper references the strengths and differences between these methods from our previous published paper “Advantages of a high-throughput measure of hair fiber torsional properties”. Using the Dia-Stron Fibre Torsion Tester (FTT950), we conducted a number of studies to illustrate the benefits of torsional measurements in cosmetic applications, using bleached and virgin hair treated with either an oil or a market-leading shampoo and conditioner. The data after testing the torsional modulus of each group indicated significant differences between all of the treatments that were not captured when measuring the elastic tensile modulus on the same fibres using the same instrument. Demonstrating the positive effect of the oil-based treatment and market leading hair care system on hair torsion behaviour illustrates the ability of this mechanical method to highlight clear and significant effects from cosmetic treatments, which could be key to developing new ingredients and formulations targeting the cuticle layers. Our paper can be found in full on pages 383-396 of Volume 69 (issue 5) of the Journal of Cosmetic Science, or alternatively you can contact us for more information on torsional measurement techniques and the Dia-Stron Fibre Torsion Tester (FTT950).